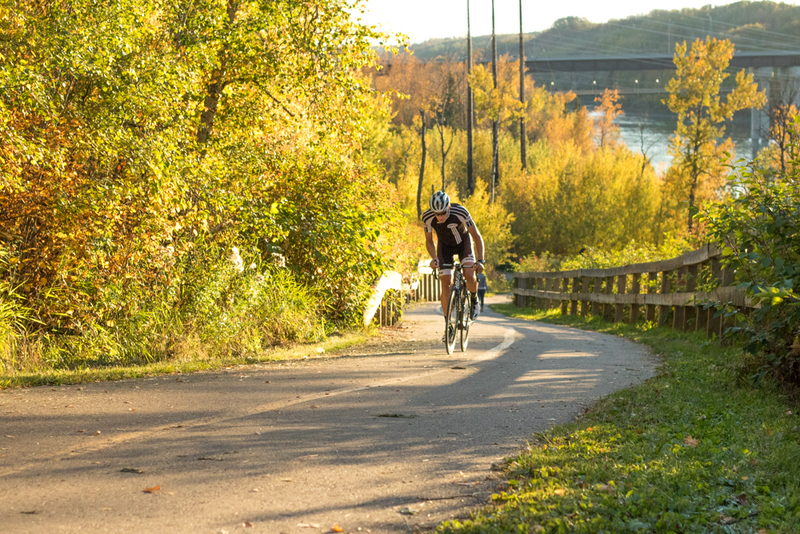 It has been a year for successful pedalling partnerships. Not only did we have a new king and queen of the hill tonight, with Ulf Kleppe equalling Shane Rush’s course record and Joy Mekechuk setting a new women’s record, but also Kathy and Ken Miller have been nominated as the Most Improved Riders for 2016, while Sherry Haque and Dan Edgcumbe will take home the Womens A and Master A BAR trophies for 2016. 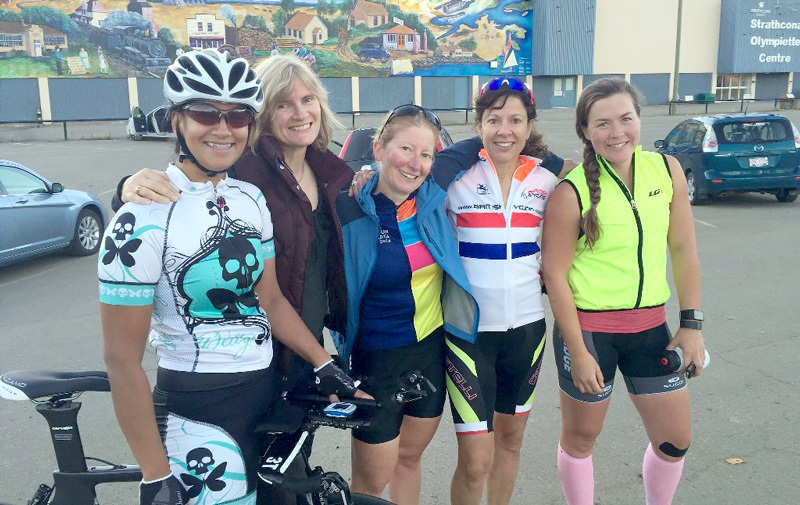 For the second week in succession we had five ladies – almost 30% of the field this week – riding, and here they are: L to R: Sherry, Gail, Kathy, Joy, Katie. In the absence of Bruce Copeland, having already won the Maurice Johnson Memorial Cup for the Age Standard Competition by a country mile, it was much closer at the top tonight. Peter Heppleston did just enough to hold onto second place in the Competition from late-surging ex-European and now Americas Masters champion Clive Burke. With two events to go, all the BAR trophy competitions are already won except for Master A and Master D. In Master A only one point separates Dan from Dan. With Dan E. not riding next week, Dan N. completing his volunteer commitment at the hill climb, and Stuart Wyllie sucking up points as the key spoiler, this is very much either Dan’s race. Remember to watch for Juventus/EMCC member Ross Wilson representing Canada on the bike at the Paralympics in Rio. What a pleasant, calm, warm evening for a bike ride. Pity we had to spoil it with all that sweating and heavy breathing and involuntary blood-letting. When I saw that Kathy Miller was the only rider to miss out on a plus – by only three seconds – I thought I should point out that she was on a road bike and actually did a very good ride. Then I realised it was only fair that I should also point out the other riders who were on road bikes (I hope I correctly identified all of you). Once again the sun smiled on us just long enough to get the race in. The roads were a bit damp and dirty in places, but at least it wasn’t raining. New member Katie Hughes competed in her very first road race, rode quite comfortably and finished well up in Group 2. Some funny business in Group 2 along the final straight sent Iman Koeman into the ditch, but he was able to stay upright and Sagan his way out and back onto the road. And after that there were a couple of other close shaves before the line, that could easily have given the on-site paramedic something to do for a change. With five midweek events to go most of the Best All Rounder competitions appear to be more or less settled, except for the Master A and Master D categories. With both Dan Nelson and Dave Embury scheduled to work the season-ending hill climb, and with Stuart Wyllie and Ed Heacock possible spoilers in their respective categories, these two categories could get very interesting and could go down to the wire. As ever, an interesting evening at the Research Park. There was thunder to the left of us, thunder to the right of us, and in front of us a #74 ‘bus that was either two hours late or taking the passenger for an off-route scenic tour; Ken Miller was balked by the slow-moving and confused ‘bus. A tie in the final B omnium placings was decided by the TT times. Sherry Haque rode her first-ever criterium, and thereby extended her lead over her shadow in the Women A BAR, while other half Dan Edgcumbe moved into the lead in the Master A BAR – could this be a first-ever double BAR for husband and wife? 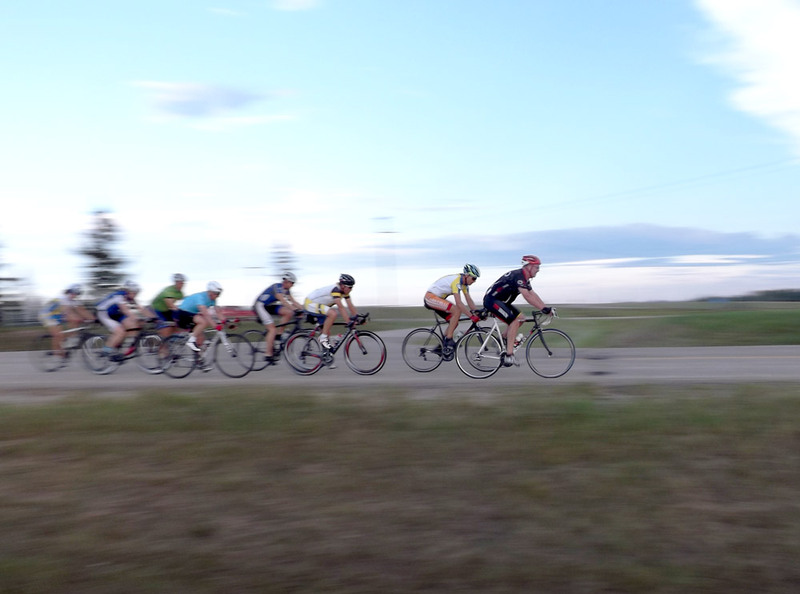 There were a couple of other out-of-towners (Sherry and Dan live in Vegreville) out tonight – Iman Koeman was in from Westlock to ride his first race in some years, and some of you may remember Len Blair, one of the original Team Fat and EVCA guys, back in Edmonton to visit family. The southbound leg of the Bon Accord 40 course must be the hardest, must unrelenting eight miles this side of Apex Summit. 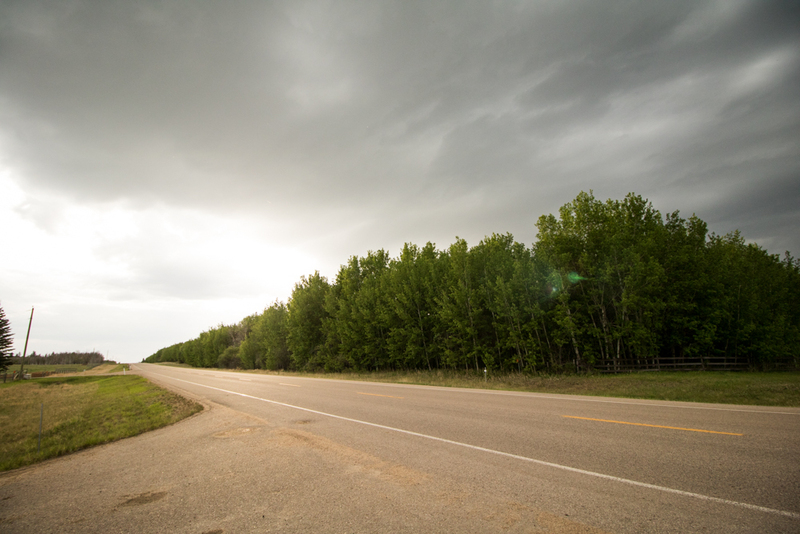 The only nice thing about it is the name – Lily Lake Road. Or maybe I’m just getting old. For the first time this century we had a tandem out racing, and I believe it was just about the first-ever ride on a tandem for both Charlotte and Malcolm – that’s diving in at the deep end! Ross Wilson was looking pretty fast, just a few weeks before the Paralympics. 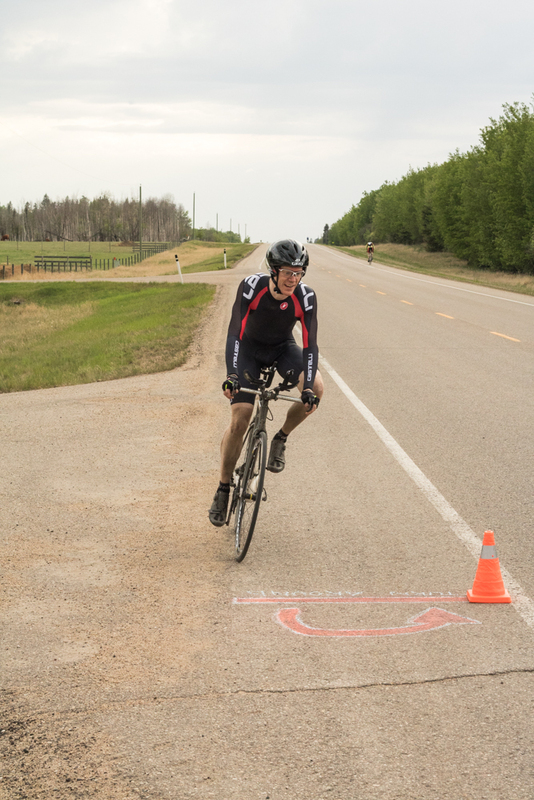 The only way for Bruce Copeland to lose the Maurice Johnson Memorial Cup would be for him to walk – slowly, carrying his bike – the remaining three time trials. Some of the BAR competitions appear to be pretty much sewn up, but not the men’s A, C, and D trophies, or the women’s C trophy. Despite the traffic chaos in the city, an adequate sufficiency of riders and volunteers made it out to the Glory Hills, where it was bone dry, but hot and humid. For Ed Cook it was his first-ever road race at the age of 70, and he learnt a couple of those lessons that any novice has to suffer through. It was another road wet, road dry evening, as my Uncle Silas might have said. From comments received at the last two time trials, it seems that challenging and different courses make a welcome change from straight-out-and-back clock-bashes. 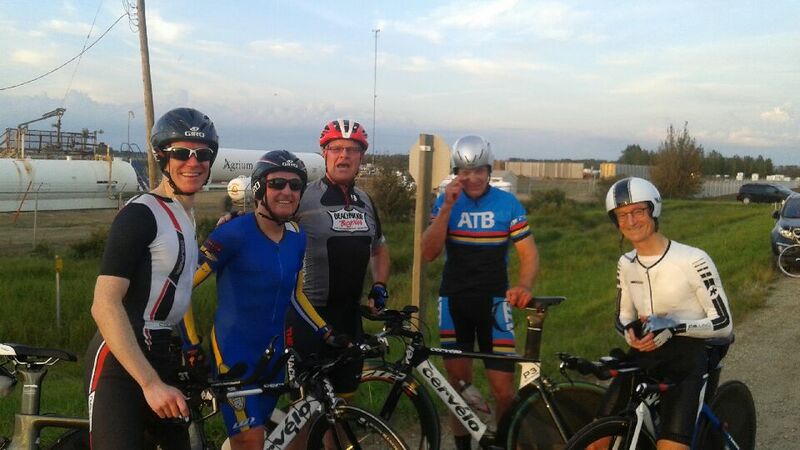 As well as the riders who turned out on another iffy evening (the later starters rode through a short sharp shower on the top right-hand corner of the course), some ex-EMCC members came out to support Marcy at the Graeme Dibbs Memorial TT. Marie Kaplan and Linda D’Ilio were there from Victoria, along with Kate Reed and celebrity photographer Lori-Ann Muenzer (if anyone out there doesn’t know who Lori-Ann is, please google her!) from Edmonton. And Dan Preston was out for a drive, recognised Peter Bigg out on the course, and stopped in to spectate at the finish. Spare a thought for Old Peter Bigg, riding for Graeme and for his late wife Jackie. He was very disappointed in his ride, his first race in many years, finding both the uphill and downhill difficult. But he finished, and how many other people do you know who would even consider a racing come-back at the age of 84? All the feedback on this new Muir Lake circuit course was that it was positively hard, and that we should do it again next year. With everyone on road bikes and a bit of climbing thrown in, the Age Standards result took on a rather different look. Anyone getting a plus was doing very well on this course. For the second time this year we had conditions that in the past would have seen everyone racing off to Tim Horton’s, but once again we raced through the rain with nary a whimper. Dan Hunka had a notable clean sweep of all the events, and first-time criterium rider Charlotte Funke overcame the fear of the unknown, finished all the events and had fun. 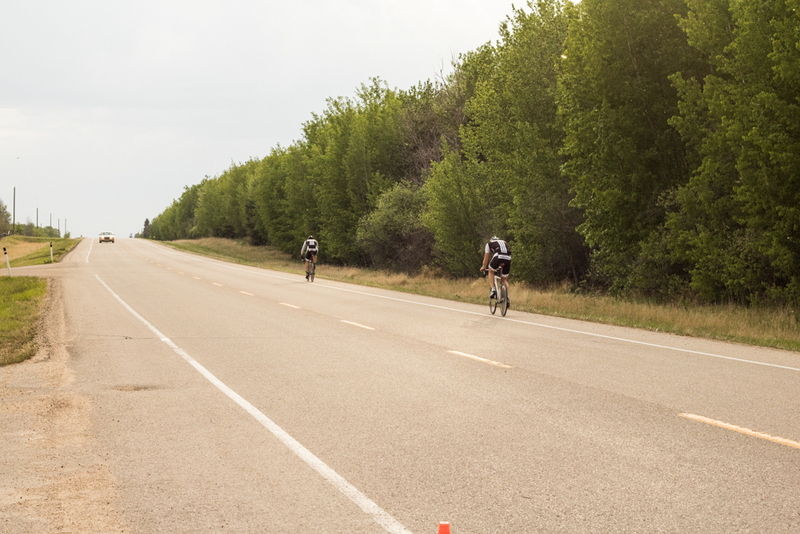 It was a dark and stormy afternoon in Edmonton, but the evening in the County was quite pleasant, if you like your time trials slightly hilly that is. Almost half-way through the midweek season, and Bruce Copeland has a perfect score in the time trials, is running away with the Maurice Johnson Cup again, and is making the rest of the C-men work very hard just to keep up in the BAR. Dave Embury looks as though he is running away with the Master D BAR in his first year in the category, with only Clive Burke even close. And Elka Strohschein has a firm grip on the women’s B trophy already this year. The next time trial, the Graeme Dibbs memorial event on July 13, is just a little bit hillier again, although it is quite short. Road bikes only, too. Last week we had 26 riders out for the time trial, and last night we had 27 riders out for the road race, but only 25 actually started. One person decided he didn’t like the look of the threatening storm and went home; one other person was prevented from starting by a series of senior moments that he may be able to look back at and laugh about by Christmas. As it happened, the storm never materialized over the race, although my little group had a short cooling shower on the last lap. And I thought I was having a senior moment when I saw a corner marshal chase after and grab a black piglet running loose on the road. 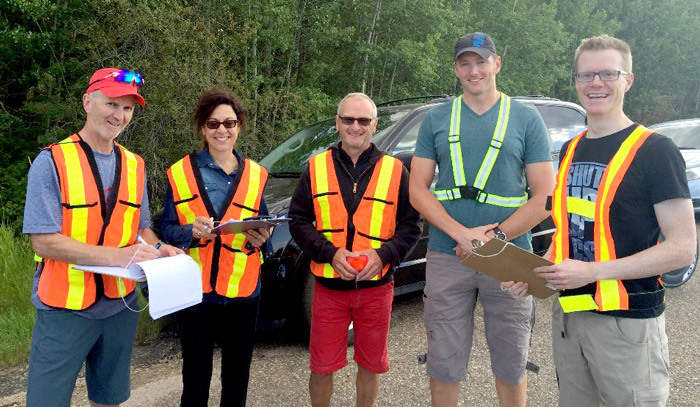 We’ve had volunteer gooseherds at the Research Park, volunteer mosquito swatters at Bon Accord, now a volunteer swineherd at Northern Bear – what next? What looked as though it was going to be another wet and windy evening suddenly turned calm and cool, and so the mosquitoes came out to play too – race chief Tom Mumby busied himself swatting the animals off riders as they lined up at the start. We had a couple of new members out for the first time, and it was nice to see three Women B competing. In all the plethora of go-faster aero toys there are still some guys toughing it out on road bikes. To you I say July 13th, road bikes only TT, when the playing field will be level, even if the course isn’t. 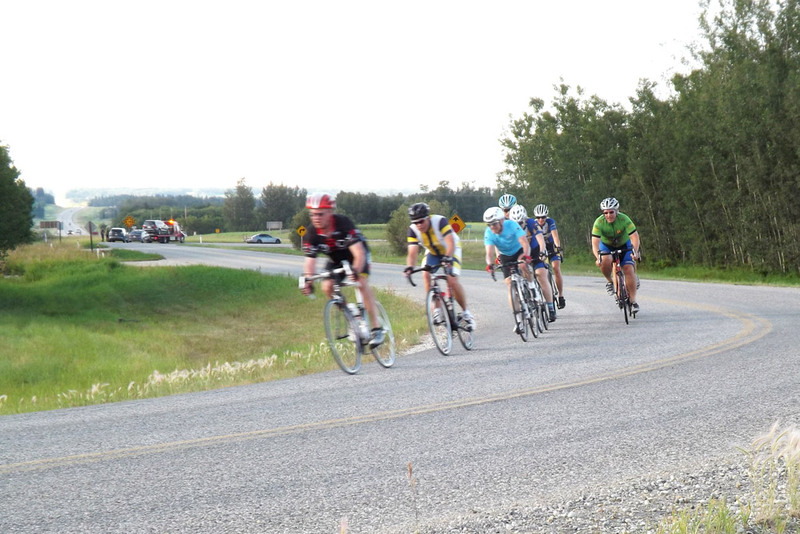 By 7:00 pm we had as many riders as we had volunteers, the rain had stopped, and the race was on. By start time a few more riders had shown up, but we lost Curt Roper to broken spokes moments after he started the TT, so we only had enough riders to make up one “ability” group. Most did make an effort to wear different jerseys, and even though the number of riders was down from last time this did make things much easier for the volunteers. The handicap was a hard and exciting race – although the front of the scratch group managed to catch the tail-end of the longmarkers group in the final straight, it was the longmarkers who took the first three places. The menacing dark clouds faltered to deceive, and by start time it was quite sunny and warm. But that didn’t make it any easier – this is a deceptively hard course, it seems much easier on a Sunday ride in the group. We had riders with broken bones in various stages of repair, a couple of guys coughing and spluttering their way around, and a surprise visit by CTV News, out to do a piece on Ross Wilson. It was nice to see the three oldest members of the club out and racing. And spare a thought for the guys who didn’t beat their Age Standard – they had all given themselves the unfair disadvantage of riding road bikes. The next road bike only TT is on July 13th – we’ll see how they really compare then! Not too many years ago if we’d had rain like that just before the start of the event, then everyone would have feigned disappointment and repaired to the nearest Tim Horton’s at warp speed. Not so last night, (almost) everyone was keen and the event started on schedule, by which time all the riders and bikes were already wet and filthy. Then a couple of kilometres down the road it was a dry as a bone, not a sign of rain. A couple of new TT bikes got their baptism of mud anyway, and on a bit of a funny night several good times were done. In the Age Standard Competition for the Maurice Johnson Memorial Cup, Bruce Copeland has already established a solid lead. Nice to see that we already have 29 riders who’ve completed a time trail this year, after just two events. In the BAR competitions, both the Master B and Master C categories are looking to be very competitive again this year. 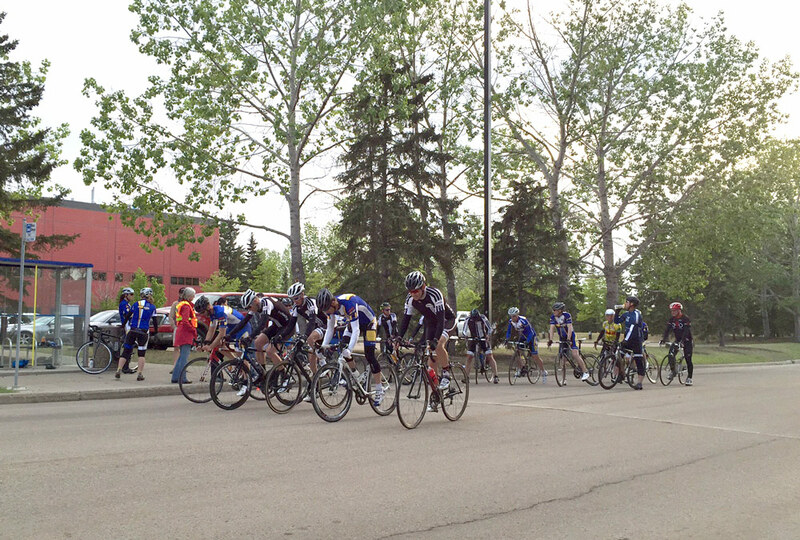 A cold north wind didn’t put a damper on the racing, and we had the biggest turnout at the Research Park for several years. Unfortunately the finish of the main event of the evening, the handicap, wasn’t recorded in a usable format, so that event couldn’t be included in the overall omnium result. 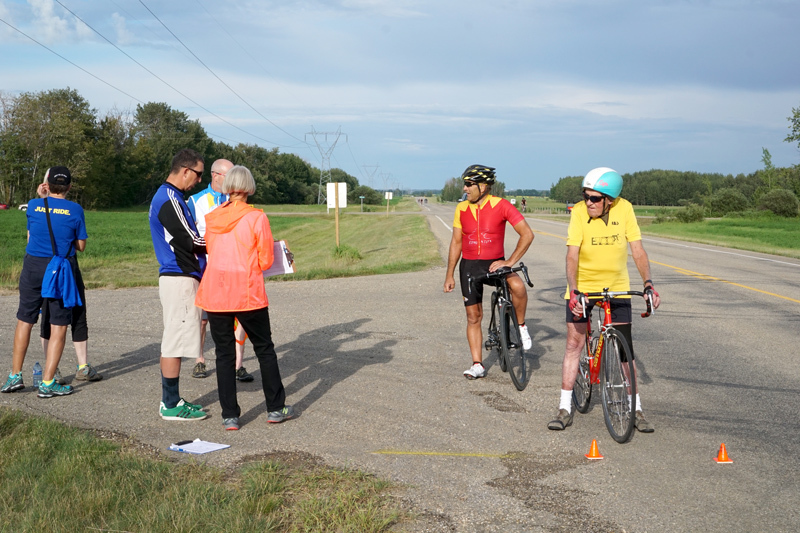 And don’t blame the volunteers – you try placing 15+ riders who you don’t know from Adam, most of whom are wearing the same jersey, coming across the thin pink line at 50+ km/h – it isn’t easy! For the next criterium omnium, riders please help the volunteers, and wear some different jerseys. We are also considering using body numbers for the criteriums – to be confirmed. For a change the first midweek event of the year wasn’t snowed off – far from it, the warm evening saw a good turn-out of 24 riders, and everyone came with or connected with a partner at the start to make up 12 teams. 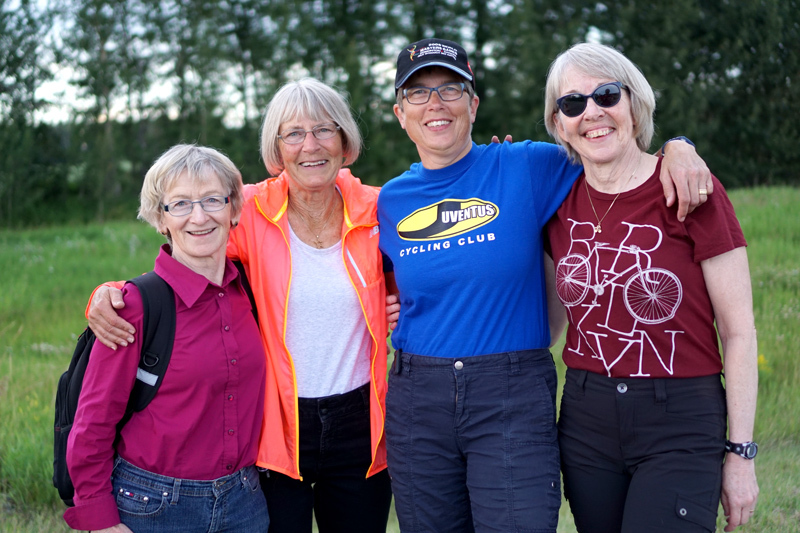 With new members Sherry Haque and Elka Strohschein, and Gail Wozny, we already have competitors in the Women’s A, B and C categories respectively this year. Hopefully a few more women will make it out as well, to compete for their BAR trophies. We also welcomed paralympian Ross Wilson, who will soon be heading off to Rio to represent Canada on road and track. And afterwards we repaired to Boston Pizza for beer and pizza, and an even better good time was had by all.